Translation: The New American Standard Bible is regarded as one of the most accurate translations available today. Published in 1995 by the Lockman Foundation. 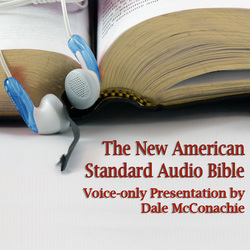 Narrator: Dale McConachieAudio Bibles recorded by Dale have been purchased in all 50 states and many foreign countries. He considers the opportunity to record the Bible to be the biggest blessing of his vocational life. His goal in recording is for you to feel, when driving down the road, as if your best friend is in the front seat, reading the Bible to you.